Today my husband, Kirk, and I celebrate our 32nd anniversary. It was a beautiful, spring day for our 5:30 PM wedding. The sun was shining through the stained glass window above the altar. Here are a couple of pictures from that day. I thought I would share this Irish Blessing with my readers on this St. Patrick's Day. A couple of years ago, Kirk and I bought a decorative plate for his mother. This blessing was on it. It has always been a favorite of Kirk's. Kirk's Irish Heritage comes from his maternal grandmother's side of the family, Corcoran. I have not traced his Corcoran lineage to a county of origin, yet. The above certificate cites the death of Mary R. D. Denny, who was born Adelia DeGan. She married Joseph Denny in 1844. Adelia 'Mary' DeGan Denny died 5 March 1905 in Grand Rapids, Kent, Michigan. She died at the age of 74, of erysipelas, which is caused by an A streptococcus bacteria, it is also known as cellulitis. A contributory cause was listed as senile debility. Adelia DeGan was the daughter of Amable-Seraphim DeGanne and Adelaide Ducharme Tetreau. The informant for the certificate was Mrs. W. L. Berry, who was Adelia's daughter, Harriette 'Hattie' Denny, who married Willard Berry. The United States was in the throes of the Civil War when Willis George Dollaway was born on 29 October 1863 in Schuyler County, New York, possibly Havana. He spent the first few years of his life living in this area. 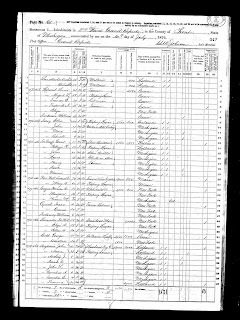 It is here, at the age of three, Willis lost his mother, Arvella Mathews Dollaway, who died in 1866. Arvella Mathews Dollaway left behind her husband, Andrew Dollaway, to raise their two young sons; Frank, age five and Willis, age three. It is during this time that I lose Andrew Dollaway in my research. It is believed that he moved to Michigan and died there, but no proof has been found. Willis lived with his Aunt and Uncle throughout his teen years. He attended Grand Rapids Public Schools through the eighth grade. One account says that Willis started his working life early, working in the mercantile business owned by Jacob Barth. Further research is needed to confirm the accuracy of this statement. 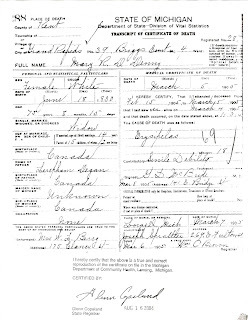 Willis George Dollaway and Frances A. Denny, the daughter of Joseph and Adelia (DeGan) Denny, were married 3 October 1885 in Grand Rapids, Michigan. 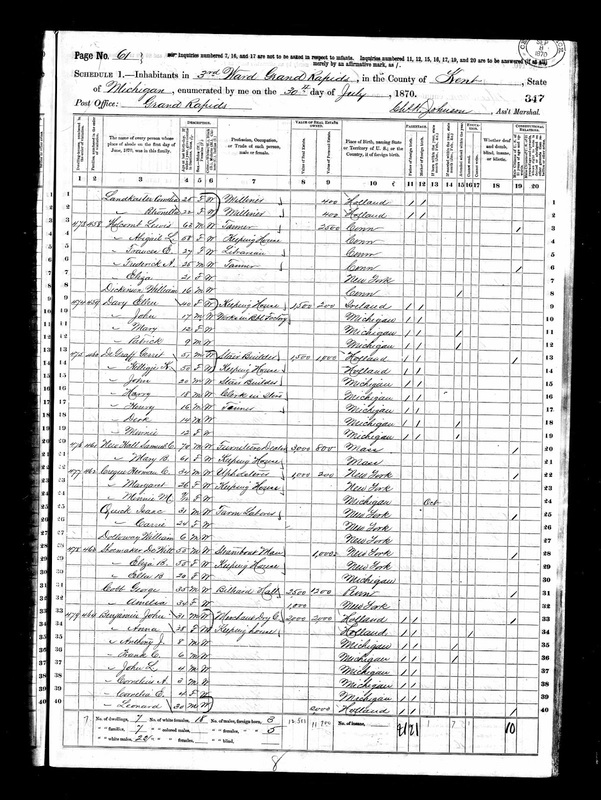 (Source: "Michigan, Marriages, 1868-1925," index and images, FamilySearch (https://familysearch.org/pal:/MM9.1.1/NQ75-N32 : accessed 11 Mar 2013), Willis G. Dollaway and Frances A Denny, 03 Oct 1885.) Willis was working as a clerk at this time. Willis worked hard as a farmer, owning 140 acres at one time. Willis, Frances and family lived in Lowell Township most of their married life. They did move in with their daughter, Leona, who married Bert Corcorcan, for a couple of years. 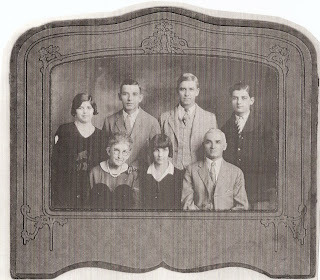 They can be found in the 1930 Census living with Bert and Leona in Grand Rapids, Michigan. By 1935, Willis and Frances, were back living at their home in Lowell. My husband remembers visiting his Great Grandma Dollaway, at her home in Lowell, as a child. He never met his Grandpa Dollaway. He remembers a glass jar of lemon drops, which would fascinate a young one. Unfortunately, the home is longer there. 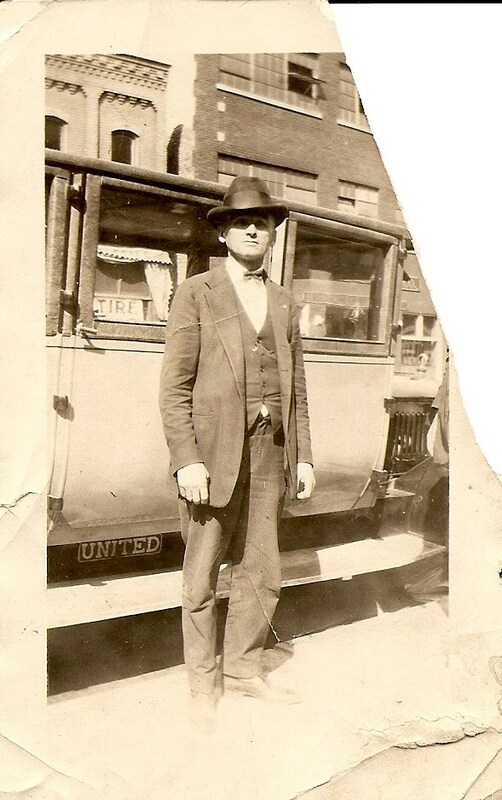 Willis Dollaway lived to the age of 76, dying on 28 June 1940 at his home in Lowell Township after being ill for several months. Willis George Dollaway is buried in Oakwood Cemetery, Lowell, Michigan. This is the funeral card for Helen Corcoran, who died 10 April 1949. She was the wife of Timothy Corcoran. Helen was the daughter of Quirin Schmitt and Barbara Schump. She died in Grand Rapids, Kent, Michigan and is buried in Restlawn Memorial Cemetery, Grand Rapids, Michigan. Ask and it will be given to you. I had written on my blog how I would like to have a wedding picture of Kirk's grandparents, Bertrand and Leona Corcoran. My mother-in-law emailed me and said her sister, Helen, had their wedding picture at one time and maybe Helen's daughter had a copy of it. I contacted one of Helen's sons and he contacted his sister and within a few days I had a copy of the picture. I love this picture. I love the veil, the dress and the flowers. I think it is a true depiction of the 1920's fashion. 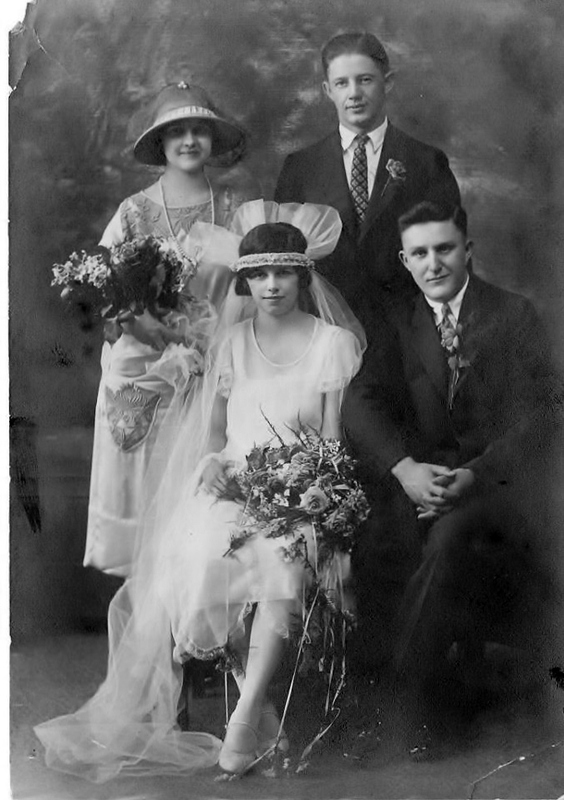 Leona Dollaway, the daughter of Willis G. Dollaway and Francis Denny Dollaway, married Bertrand Francis Corcoran, the son of Timothy Corcoran and Helen Schmitt Corcoran on 3 June 1925 at St. Andrew's Cathedral, Grand Rapids, Kent, Michigan. Leona was 20 years old and Bert was 22 years old. 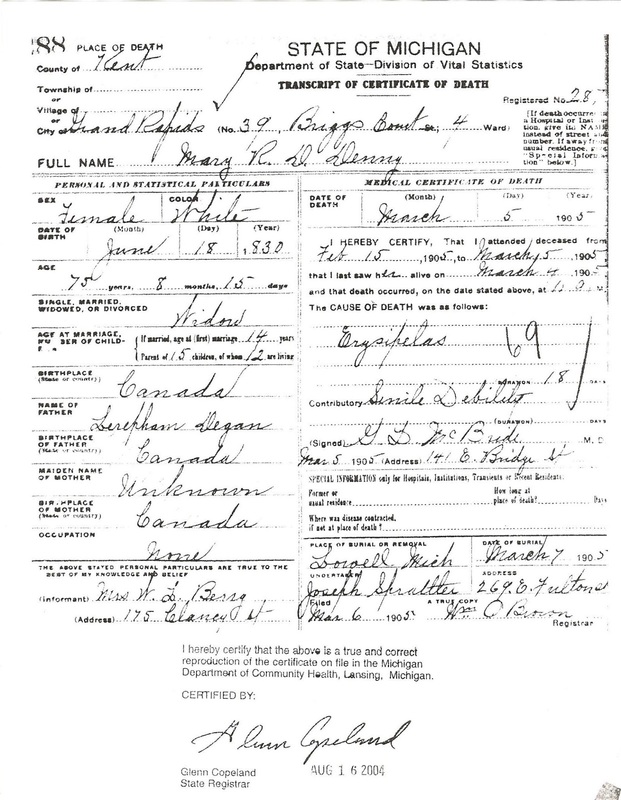 The marriage record of Bert and Leona Corcoran states that Frances Freel and Louise Margold were witnesses. My mother-in-law believes that is who is in the picture with them. Today marks my first blogiversary for Journey to His Past. 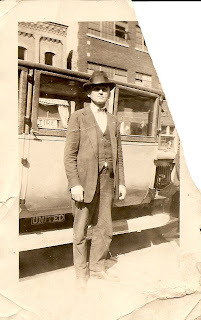 I started this blog to share my husband's ancestry. Some of you may know that I write another blog, Journey to the Past, and I didn't want to 'share' it with his ancestry. I wanted to keep it separate. This first year has been an interesting one. I don't think I had the growing pains of blogging as I had a chance to work out the kinks with my other blog. I have found it harder to write a blog about someone else's ancestors, even though I am the one who has done the research. I think the more I write the easier it will be. I don't know how to explain it, I just know I find it harder. I look forward to sharing more of Kirk's ancestry with you in the next year. I appreciate my readers, followers, and family members for their support as I enter into the year two. I just hope I don't experience the terrible twos.